This post is a contribution to a series leading to ASPI’s Future Surface Fleet Conference  from 30 March to 1 April 2015. Registration closes 23 March. A Cooperative Strategy for 21st Century Seapower: Forward, Engaged, Ready , the long-awaited revised US Maritime Strategy, was released by the chiefs of US Navy, US Coast Guard, and US Marine Corps on 13 March. As a sign of the times, it’s a more hawkish document than its 2007 predecessor —it gives greater attention to threats, forward naval presence, and the concepts of deterrence, sea control and power projection. The Strategy is an unclassified document supported by classified annexes that outline operational plans and likely opponents in more detail. It has several aims. Domestically, it informs the American public about the contribution of the sea services to national security while providing those services with the strategy on which to base their training and tactics. Abroad, the strategy aims at reassuring allies and intimidating potential adversaries. Unsurprisingly in a time of sequestration and budgetary competition, the Strategy’s also aimed at justifying the Navy’s budget. It notes that the Navy’s current budget submission will provide for more than 300 ships and a forward presence of about 120 ships by 2020, up from an average of 97 in 2014. Sixty percent of those ships will be assigned to the Asia-Pacific, including more Littoral Combat Ships and Ballistic-Missile-Defence (BMD) vessels. Higher operational and personnel costs will result, but those aren’t acknowledged in the Strategy. While the 2007 Strategy spoke of maritime forces being employed to build trust and confidence through collective security efforts, the words ‘trust’ and ‘confidence’ don’t occur in the new document in a strategic context. At a time when the Asia-Pacific region is characterised by high levels of strategic distrust, it’d be easy to conclude that the US Navy’s not much interested in trust- or confidence-building. Tensions and competition between the US and China are at the heart of current distrust in the region. The bilateral relationship is plagued by miscommunications and misperceptions on both sides. China views the American rebalance as containment while the US sees Chinese military developments as aimed at denying US forces access to the littoral waters of East Asia. As the new strategy notes without referring to China specifically (p.8), ‘The Sea Services face a growing range of challenges in gaining access and operating freely in the maritime commons’. There’s nothing in the new Maritime Strategy that’ll help that situation. In fact it might worsen it. America’s sea services could do a lot to help build trust in the region, but by emphasising the military side of the US rebalance, the Strategy only adds to the security dilemma between the US and China. As a small example of what might be possible, the current restrictions  under the FY2000 Defense Authorisation Act that prevent PLA officers being accepted at US military institutions might be relaxed to allow PLAN officers to study at places like the U.S. Naval War College. During his speech at the International Maritime Security Conference in Singapore in 2013, Admiral Wu Shengli, the Chief of the PLAN, suggested more exchanges between the younger generation of military officers to help build trust and understanding for the future. Current US policy runs against that. 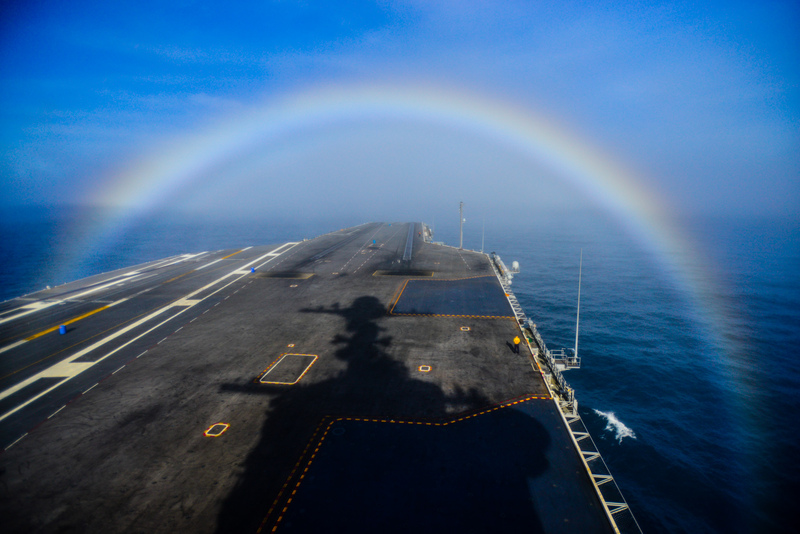 Similarly, the US Navy has recently knocked back an invitation from China for a USN aircraft carrier to visit China while, at the same time, entering into a joint arrangement with India  to develop aircraft-carrier technology. Despite the rhetoric about a global network of like-minded navies, there’s no reference in the latest Strategy to the 1982 UN Convention on the Law of the Sea (UNCLOS) and the framework that provides for cooperation. Instead the references to ‘international waters’ and ‘global commons’ look like an attempt to deny extended forms of jurisdiction under UNCLOS. The seas of East Asia, for example, are not ‘international waters’, or part of the ‘maritime commons’. Rather, they’re the exclusive economic zones (EEZs) of the littoral States which have important rights and duties in those seas, as well as an obligation to cooperate in their management. The fact that the United States is not a party to UNCLOS remains a significant limitation on its ability to exercise the leadership in the maritime domain that it aspires to. The 2007 Maritime Strategy was the basis for the concepts of the 1,000-ship Navy and the Global Maritime Partnership Initiative . The latest Strategy expresses similar sentiments, but they’re not its cornerstone. It sees maritime cooperation only in the context of naval cooperation. Relatively little attention is given to cooperation between coast guards and only token acknowledgment is given to the role of the US Coast Guard beyond home waters. The new Maritime Strategy may appeal to its domestic audiences and may help to reassure US friends and allies abroad. But in the Asia-Pacific region it may contribute to greater distrust between the US and China. Sam Bateman is a professorial research fellow at the Australian National Centre for Ocean Resources and Security (ANCORS), University of Wollongong, and also an adviser to the Maritime Security Programme at the S. Rajaratnam School of International Studies (RSIS), Nanyang Technological University, Singapore. Image courtesy of US Navy .